The Great Commission is one of the best-known teachings of Jesus — but, on a practical level, how do we respond to Jesus’ mandate to “go and make disciples”? 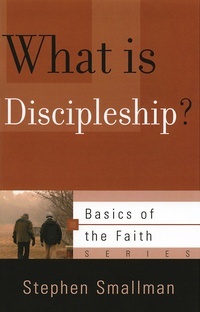 Just what is discipleship? Here are ten basic building blocks for church leaders and all concerned Christians to use as a starting point to respond to the challenge of the Great Commission in their own churches. Stephen Smallman offers a framework for a theologically sound disciple-making strategy for both believers and seekers. “Discipleship is crucial to our understanding and application of the gospel, but it doesn’t just happen on its own … Smallman trains pastors and laypeople in the fundamental but oft-forgotten elements of gospel-driven discipleship.